I wanted to mix 'Halloween' with 'The Breakfast Club' into a horror film. I was a very young filmmaker at the time of 'Cinemaphobia' so a lot of me at that age was put into the film. Lots of silly jokes and over the top death scenes. It was really the only film I could of made at that time. It's a real fun film that shows our generation in their element with movies and serial killers! Since Cinemaphobia I have made 3 features film. '41', 'Apocalyptic' and most recently 'The Comet Kids' - which has been a 2.5 year project. It's my favourite film of the lot. 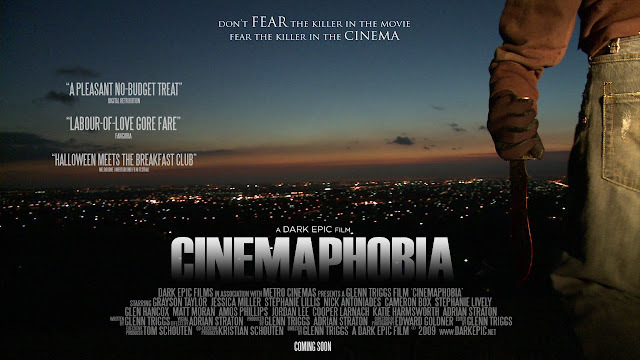 Cinemaphobia was a huge learning curve about story, pacing and organization - it's the funniest film I've ever made and we're glad to be part of 'Straight Jacket Guerrilla Film Festival'.